It's almost time to dance. With Purple Hatter’s Ball less than a week away, I’m getting ready to return to Spirit of the Suwannee Music Park for another weekend of stellar performances. On May 8-10, Florida’s premier outdoor music venue will host this festival, dedicated to the memory of Rachel Morningstar Hoffman, with a pre-party on Thursday, May 7. This year’s lineup is more than worth the price (tickets are currently $138 for a three-day weekend pass and $45 for Thursday’s pre-party), featuring Lotus as a headliner and many other accomplished and up-and-coming bands from around the country. Here’s some background on five acts I’ll be sure not to miss this weekend. By now you’ve probably heard of the musical sensation that is Nahko and Medicine for the People, a band that blends folk, tribal, and hip-hop sounds to create moving anthems for our generation. In this time of corruption and destruction, Nahko’s music brings messages of hope and empowers us to be the change we wish to see. The band itself is aligned with numerous causes, including environmental preservation and protection of native communities. Toubab Krewe fuses rock and world sounds (primarily West African) to cultivate intricate rhythms and harmonies using traditional instruments along with African strings and percussion. Since 2013, the band has been donating between fifty cents and one dollar of every ticket sold to its shows to Instruments 4 Africa to build a music school in Bali. Back on the road after taking a break last year to record the first new album since 2010, the quintet has already played a few festivals, including Little Econ Love Fest in Lakeland. Benyoro also draws on West African influences and instruments when crafting its blend of traditional and modern sounds. In the Bamana language of Mali, the birthplace of two of the band’s members, Benyoro means “meeting place”. This is what the band hopes to foster within its own sound, a meeting of meditative Malian jeliya (praise singing) and contemporary dance music. Boasting an extensive range of instrumentation — including mandolin, banjo, fiddle, cello, pedal steel guitar, washboard, musical saw, and stomp box — Elephant Revival is a five-piece folk music experience. The band’s influences include gypsy, rock, bluegrass, and Celtic music, and each member writes songs with the goal of uniting people across all cultures. Elephant Revival also supports humanitarian causes, such as hunger relief and women’s rights. Painters and co-founders of the Chapel of Sacred Mirrors, a visionary art temple located on 40 acres in Wappinger, N.Y., Alex and Allyson Grey have been driving forces in the ever expanding visionary art movement. The two will give a 30-minute presentation on Friday and stay to paint throughout the remainder of the weekend. Are there any other acts you think belong on this list? 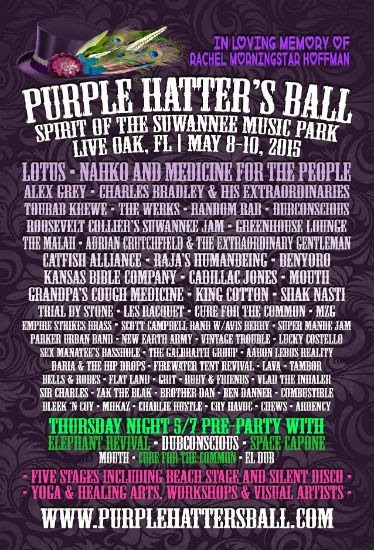 Share your must-see list for Purple Hatter’s Ball in the comments. Don’t have a ticket yet? Get one here.